Our Good Friday service at St. Mark’s is a Tenebrae or Shadows service. I obviously can’t replicate the visual experience of this service as the light go off reading after readings. But what I have grown to love is the raw essence of this service. We read the entire passion story from Gethsemane to burial and we do that with voices from the congregation. Those contemporary voices blend with the hymns that have been paired after the readings. Its a living example of religion. We received this, we make it our own and then we tell it. The appointed texts for Palm Sunday have morphed into The Sunday of the Passion. The introduction to the passion story in Mark is the story of the woman who breaks an alabaster jar and anoints Jesus with perfume worth a year’s wages. This sermon uses that as the main text with the two trials of Jesus as the supporting texts. Its focus is upon the human fascination with Justice and what these trials have to tell us about our justice. The woman’s beautiful act or good work marks Jesus response to our calls and his alternative. We can always do justice. What we have we can do. But calls for justice miss the instruction of the passion of Jesus. The better path is mercy – sweet, pure and costly. Musical Note: The season of Lent to me has the best Hymnody (which I know could just be because of the inherent drama), and it really ends on Palm Sunday which has a huge stable of great songs. All Glory, Laud and Honor and Ride on, Ride on in Majesty are two of them. What I left in the recording here is a modern hymn that is climbing my personal favorites – No Tramp of Soldiers Marching Feet (LSB 444). Many of the Palm Sunday Hymns reflect the irony of the triumphal entry being followed by the passion, but this hymn makes that its central theme. In the service it makes the perfect transition hymn from the festivity of the Palm Procession to the Passion Readings. The framing in the world was a massive lottery jackpot. This is not a railing against the lottery, but let me just say the things we surround ourselves with and allow say something about us. The massive growth of lotteries, casinos and “gaming” over my lifetime might tell us something about what we actually worship or at least how we view the world. A step away from despair is to see the world as random, nothing more that lottery balls bouncing through the world. 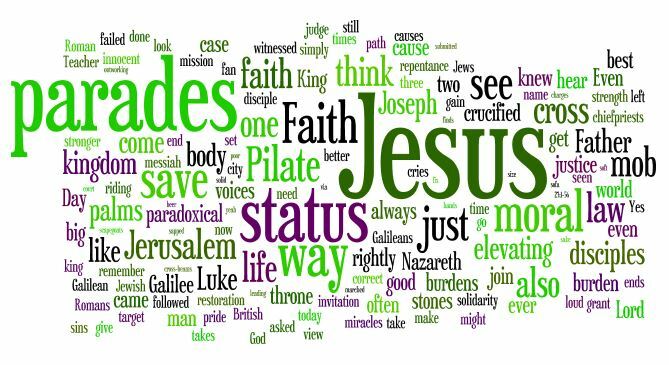 There are many things we can take from Palm Sunday or the Pilate Readings. But one theme would be that the world has a King. This world is anything but random. 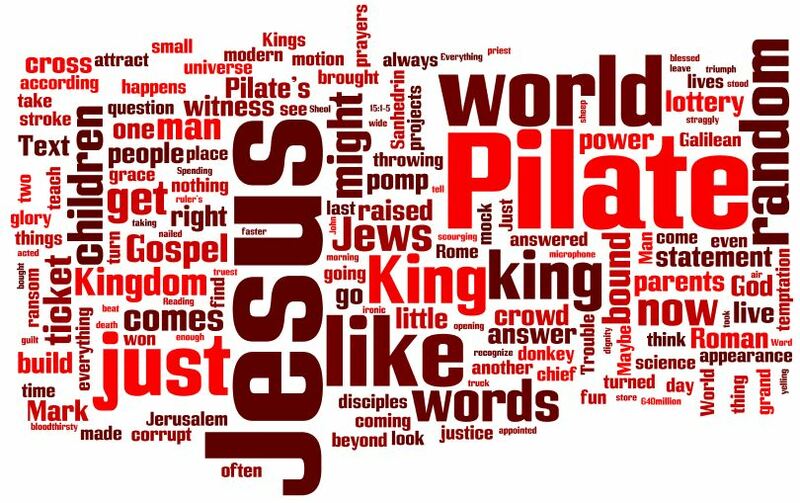 If we are tempted to think that nothing matters – like the world weary Pilate – the passion says no. Everything is full of meaning. And the most meaningful things are rarely dressed like Kings but can be found in the humblest places. I can’t say that I’m an Apple product user (although when I did get one of their products I would never get anything else after it). I didn’t know that Steve Jobs had been a Lutheran as a child before I read this. There is so much else swirling around I’m surprised it cut through it. But watching Charlie Rose last night way too late and seeing a much younger and healthier Jobs it struck me at how much his death was actually hitting me. And I’m not talking about a reality of death, or slipping into an elegiac melancholy, or an existential scream or any of that. Just that Steve Jobs was someone who gave a flip. He so passionately gave a flip that the stories about firings and iPhone battery life, and “angry Steve” and control freak are legendary. And Steve Jobs was not someone without perspective. The story is told about the Apple VP and the janitor. To Steve, the janitor could say the wastebasket wasn’t emptied because the door to the office had been locked and he didn’t have a key. You can’t expect a janitor to solve these things. The apple VP on the other hand, the Apple VP never says “that isn’t my area of responsibility”. At some level it doesn’t matter. It is your responsibility. Steve Jobs gave a flip. He wanted to surround himself with people who gave a flip. Its not that he wanted to “change the world” in that tired phrase. Steve Jobs just wanted things to work, and he wanted you to want things to work. People don’t change much – or at least that is what I’ve observed. My guess is that 8th grade Steve gave a flip. He probably was a great confirmation student. Absolutely impossible, but the kind you want to teach. At one point people like that, like Steve Jobs, used to have a place in the church. St. Paul sounds a lot like Steve Jobs to me. He passionately gave a flip and would tell you about it. We read some of that last week in Philippians 4:8-9. St. Francis gave a flip. Luther certainly did, he staked his life on it. Wesley gave a flip – the church wasn’t just the English gentry at prayer – it included all those in the hardscrabble. In the same way Mother Theresa cared through 40 years of dark nights and Indian hell. Lutherans were in the news yesterday also because of a Supreme Court case. I’m sure that it is an important case as everyone said. The church does need its sphere of freedom. But do you know what it boiled down to me: we are the church that says we can fire a sick person and say that is ok because we are the church. Fine, go fight over freedom. But if that is what we are using our freedom to do we are badly missing the mark. We’ve lost before we’ve begun. That is a church that doesn’t give a flip. In a Steve Jobs church, that wouldn’t be acceptable. Lord have mercy.